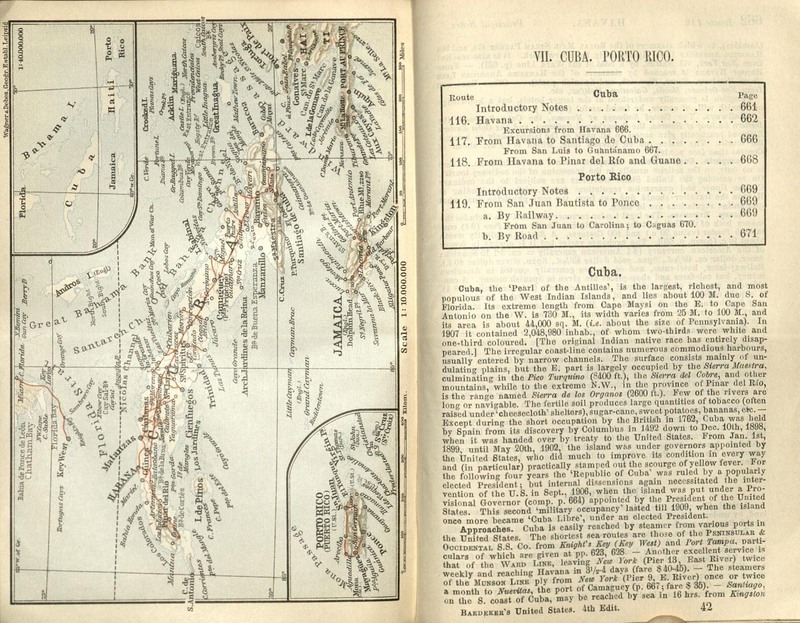 Baedeker's travel guides, produced by publisher Karl Baedeker and his descendants beginning in the 1830s, were hugely popular with European audiences travelling around neighboring European nations and the far-flung reaches of their colonial empires. 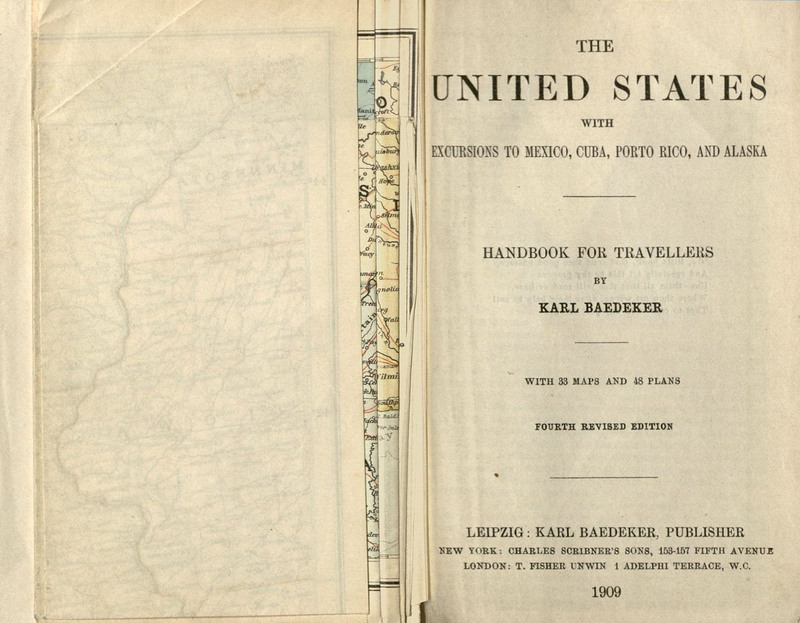 Baedeker wanted travelers to find all the information they needed about transportation, accomodations, restaurants, tipping, local sights, average prices, local cultural practices, and more within his travel guides. He did not invent the travel guide, but the quantity of detailed information included in every Baedeker volume resulted in their overwhelming popularity. 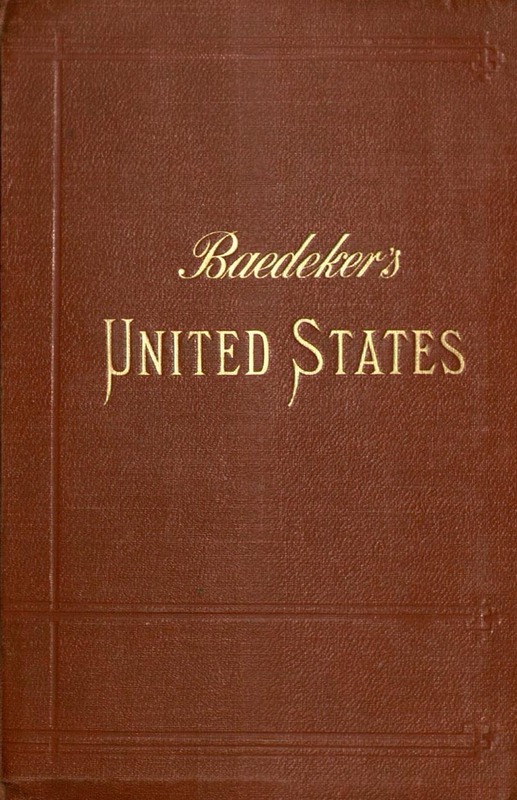 Indeed, the word "Baedekers" was almost universaly used when referring to travel guides for several decades, and the guides were hugely influential in shaping the way Europeans interacted with and experienced non-European cultures through the early 20th century. 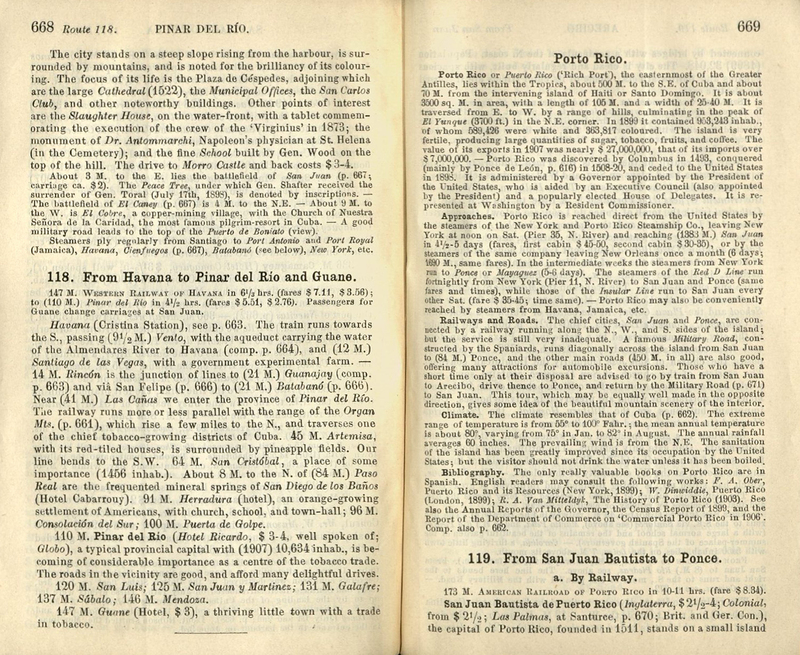 Special Collections has Baedeker guides dating from the 19th and early 20th centuries for dozens of locations around the world, including Italy, Northern France, Belgium and Holland, Russia: with Teheran, Port Arthur, and Peking, Palestine and Syria, Egypt, and more. 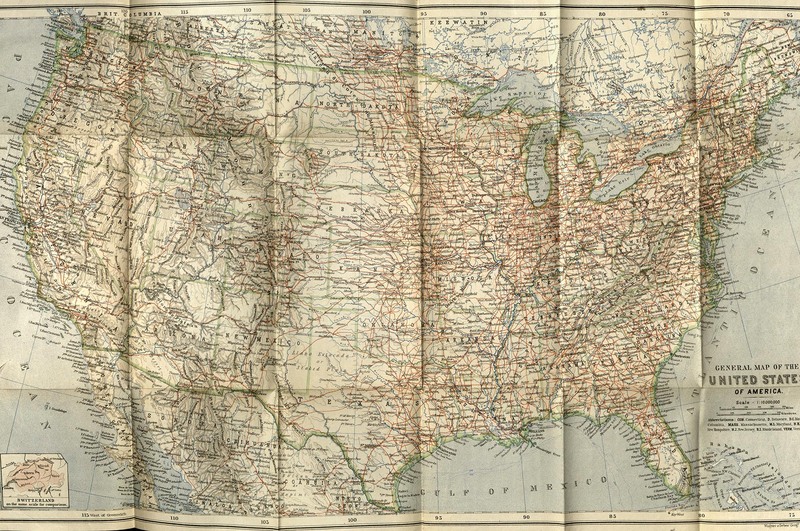 A Baedeker guide from 1909 titled The United States: with Excursions to Mexico, Cuba, Porto Rico, and Alaska, begins with general information for Europeans visiting the United States, which then consisted of 46 states, four territories (Arizona, New Mexico, Alaska, and Hawaii) and two "dependencies" (the Philippines and Puerto Rico), officially called unincorporated territories. Brief sections explain the US currency system, transportation systems, hotels, restaurants, and the post, as well as the US system of government, climate, culture, and other information visitors might find useful. 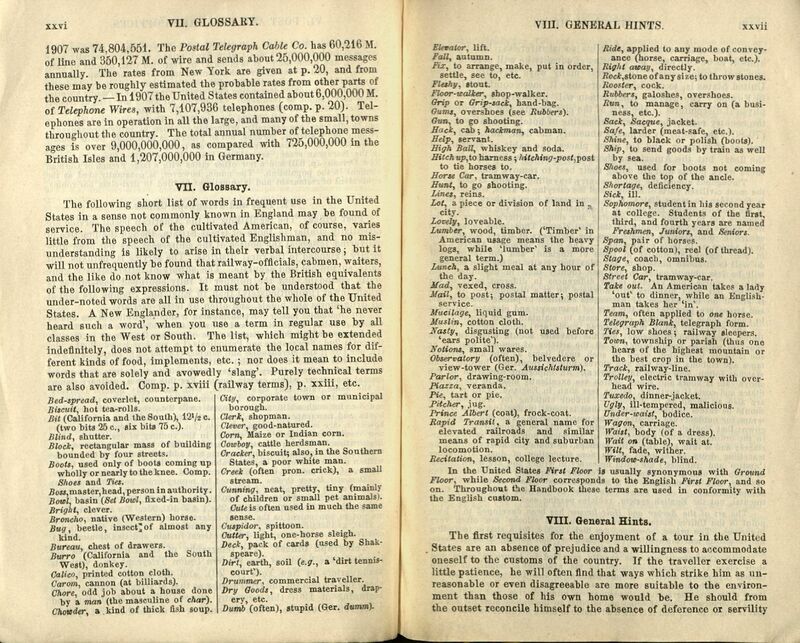 As an example, this volume includes a glossary of "words in frequent use in the United States in a sense not commonly known in England," (p. xxvi). 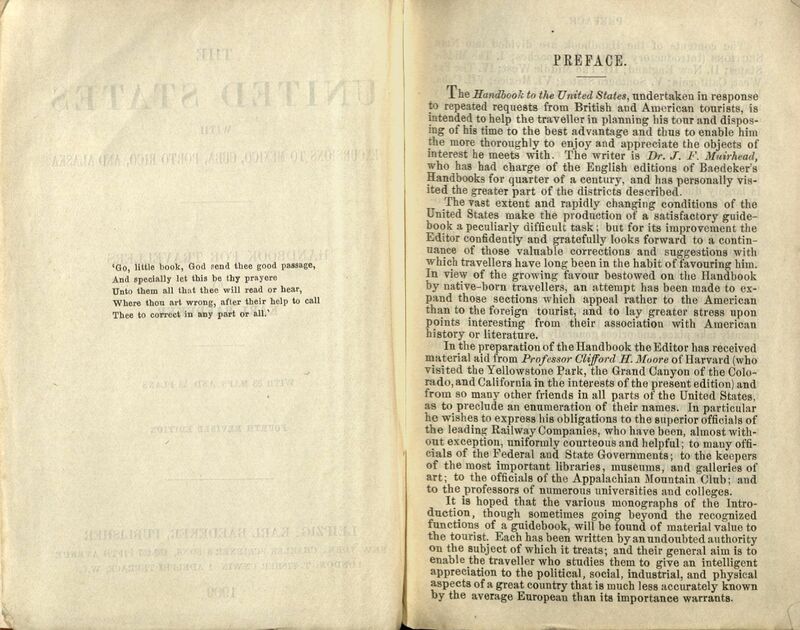 The section that describes the federal government states "Americans are as a rule well satisfied with their system...which in many respects might serve as a model to Europe," (p. xlvii), notable in that Europe was overwhelmingly ruled by monarchs in 1909, though it later describes the American Congress as a body that "attempts much" and "accomplishes little" (p. li). 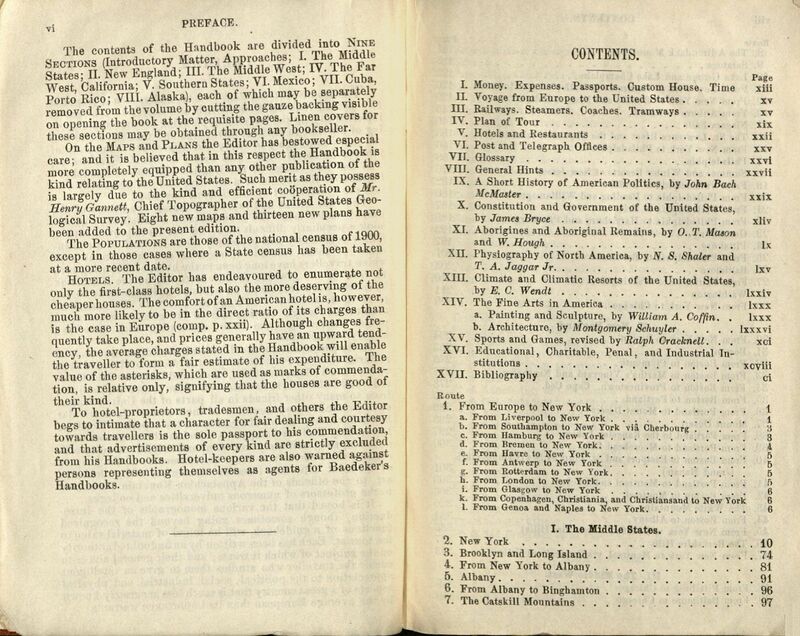 Subsequent chapters address the continental US in five parts. The chapter titled "The Far West. 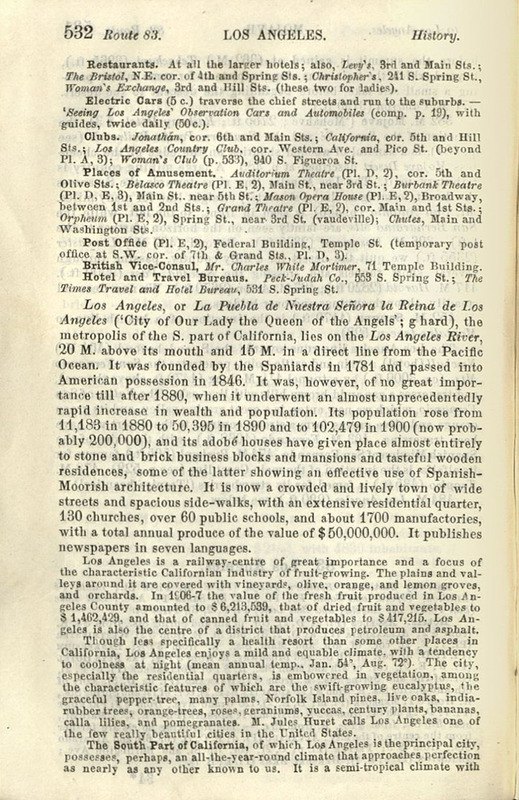 California" includes information about visiting Los Angeles before the existence of the film and entertainment industry that fuels so much tourism today. 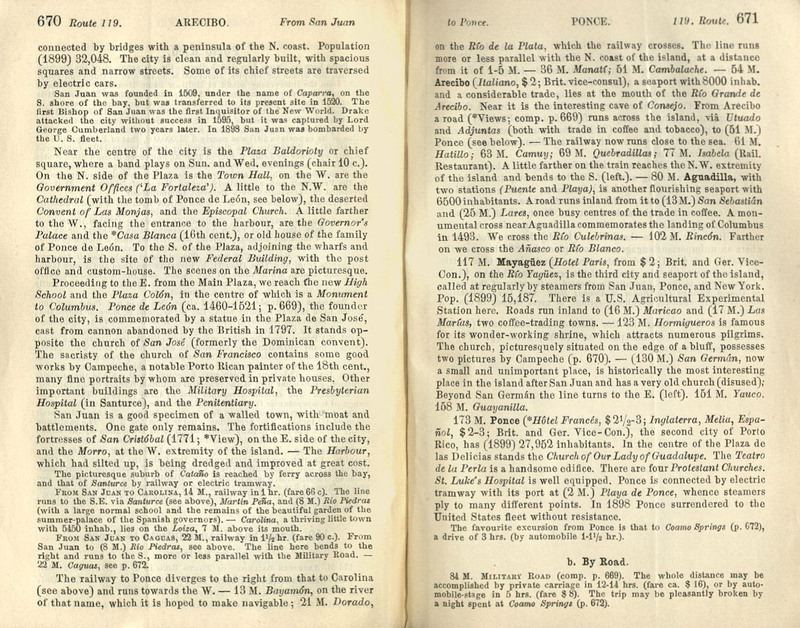 It begins with short and long versions of the city's name, with pronunciation tips: "Los Angeles, or La Puebla de Nuestra Señora la Reina de Los Angeles...g hard," then goes on to provide historical information that glosses over details European readers may have found challenging, unpleasant, or uninteresting. 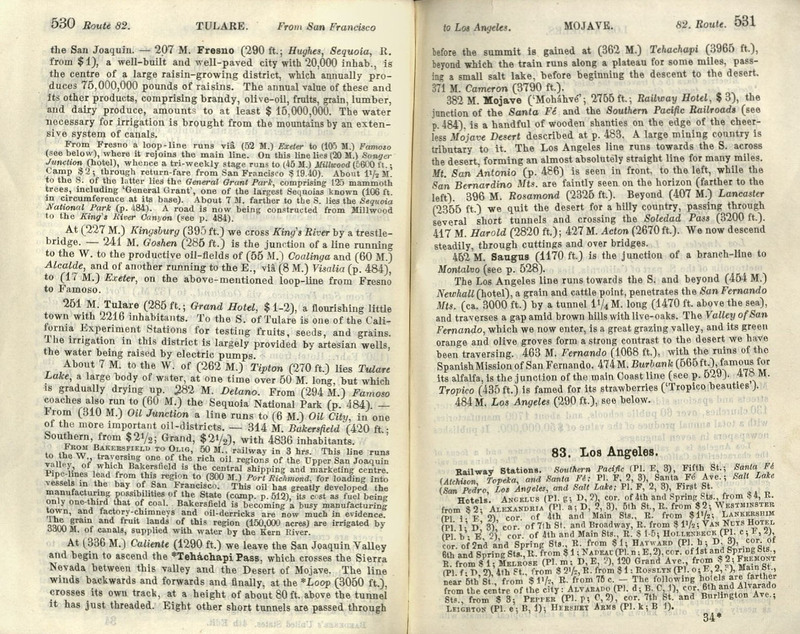 For example, it states Los Angeles "was founded by the Spaniards in 1781 and passed into American possession in 1846." It goes on to describe the city as "a crowded and lively town" that "publishes newspapers in seven languages," and describes LA's climate as one that "approaches perfection as nearly as any other known to us" (p. 532). 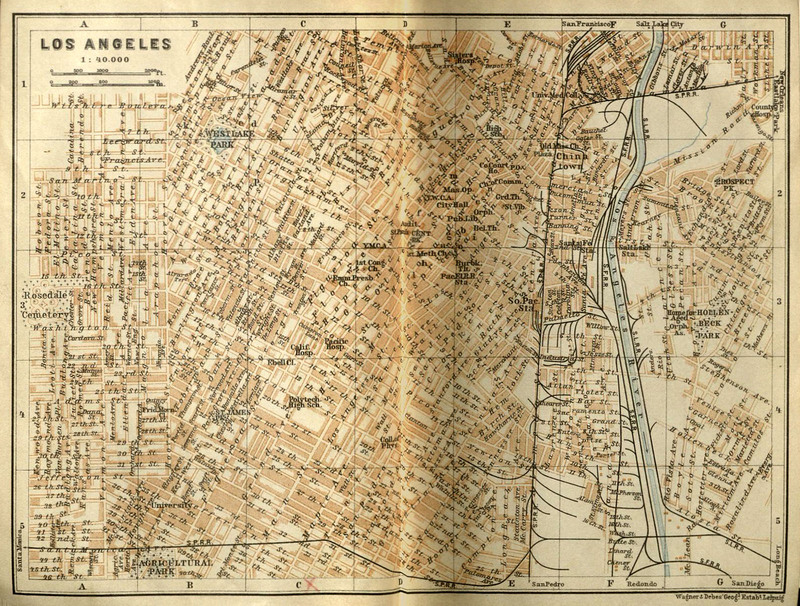 A map of the city, much smaller in 1909 than it is now, shows the locations of MacArthur Park (then called Westlake Park), Chinatown, the Angelus-Rosedale Cemetery, the University of Southern California (labeled "University"), and more, with arrows pointing toward Santa Monica, San Francisco, New Orleans, San Diego, and other off-map locations to help orient the reader. The final chapters of the book are devoted to locations outside the US vacationers might visit if already travelling across the Atlantic, including Mexico, Cuba, Puerto Rico, and Alaska. Beyond their geographic proximity, Cuba and Puerto Rico may also have been included over other Caribbean islands because the US gained temporary control of Cuba and ownership of Puerto Rico from Spain following the Spanish-American War. As an unincorporated territory of the United States, Puerto Rico's name had been anglicized to "Porto Rico" by 1909, and the island was administered via a combination of US military and civilian officials. Puerto Ricans were not then US citizens as they are now, and were only permitted to elect members of their lower congressional house. Members of the upper congressional house and all governors were appointed by the US government. The guide glosses over these aspects of American imperialism and several centuries of Puerto Rican history that preceded it when it briefly states "Porto Rico was discovered by Columbus in 1493, conquered...in 1508-20, and ceded to the United States in 1898...It is represented at Washington by a Resident Commissioner," (p. 669). It goes on to describe the city of San Juan as "a good specimen of a walled town, with moat and battlements" that is "clean and regularly built, with spacious squares and narrow streets," but then abruptly asserts "[i]n 1898 San Juan was bombarded by the U.S. fleet," (p. 670). The guide quickly moves on to other locations outside of San Juan that might entice foreign visitors, including San Germán, described as "historically the most interesting place in the island" with "a very old church" (p. 671), and "Coamo Springs (Los Baños de Coamo...), possessing some much-frequented hot sulphur springs, of great efficacy in cases of rheumatism" (p. 672).